AMD has updated Radeon ProRender, its free, GPU-accelerated renderer, for 3ds Max and Maya. The update adds support for interactive viewport rendering, tonemapping and V-Ray material conversion. 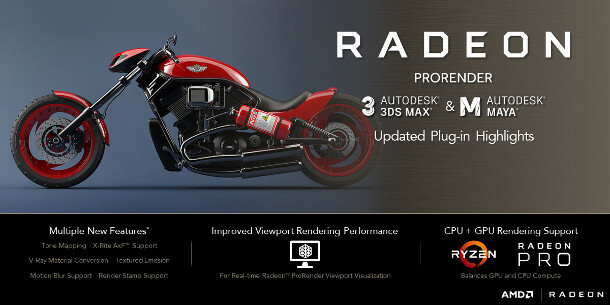 The updated plugins were released alongside two new editions, Radeon ProRender for Blender and SolidWorks, plus the first beta of a new tool for importing CAD models into game engines. Originally known as FireRender and released under its current branding last year, Radeon ProRender is an unbiased path tracer with the basic range of features you would expect in an engine of this type. 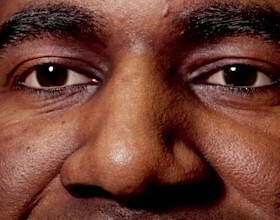 It’s GPU-accelerated, and being based on OpenCL, should be compatible with any manufacturer’s hardware. It also ships with its own material library, which can be used in any of the host applications. The latest update fleshes out that basic feature set significantly, with the both the 3ds Max and Maya editions getting support for tonemapping: an option also present in the new Blender version. The Maya edition also gets support for displacement, volumetrics and accelerated subsurface scattering; while the 3ds Max edition gets support for depth of field. Equally signficantly, it’s now possible to work interactively: the Radeon ProRender is now integrated into the host application’s viewport – in 3ds Max, it’s an ActiveShade renderer – and updates in real time. There is also a new option to “assign local resources to your GPU or CPU, or both simultaneously” – presumably, to optimise rendering performance according to the configuration of your workstation. Both editions also now support V-Ray materials – in the case of the 3ds Max edition, the process is described as a “basic scripted conversion” to Radeon ProRender’s native material format. The update also adds support for scanned materials in X-Rite’s AxF format, supported in Iray and Maxwell. Radeon ProRender for 3ds Max 2.1 is compatible with 3ds Max 2016 and 2017, running on 64-bit Windows 7+. The current Maya releases – version 2.2 for Windows and 2.1 for Linux – are compatible with Maya 2015 and above, running on Windows 7+ and CentOS 6.5/7.2 Linux. For GPU acceleration, AMD graphics cards are “recommended”. You can use any Intel or Nvidia card that supports OpenCL 1.2, but only if you’re running Windows 10.